With the Lathe off, we move the tool so that the tip is lined up with the start channel on the right hand side. We will cut from right to left. 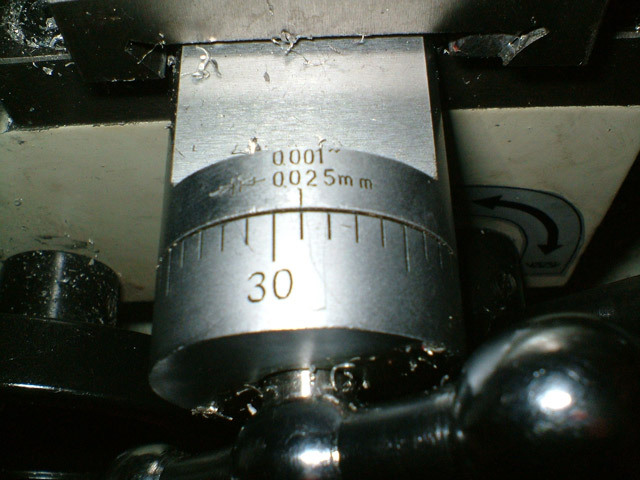 Advance the tool in so that it is only a fraction further than the measurement for touching the job. See my image left - I am now on the 29 marker. Now adjust the change gears. 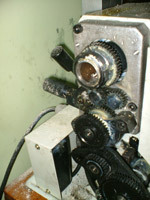 The change gears on the lathe link the main rotational axis of the chuck to the threaded bar along the bottom front of the lathe (known as the lead screw). By selecting different gears you can make the lead screw rotate at different rates proportionally to the rotation of the chuck. You have to select the gears for the pitch of thread you require. The level out the back engages and disengages the drive to the lead screw. Once your gears are installed, make sure this lever is locked in the position that will make the carriage advance from right to left when the half nut lever is locked down. With the halfnut level released (ie not locking the carriage to the leadscrew) turn the lathe slowly and examine the thread indicator dial. When the carriage is not locked to the leadscrew and the screw is turning, the dial will rotate slowly. The picture on the left shows some homemade scratched marks on the dial. 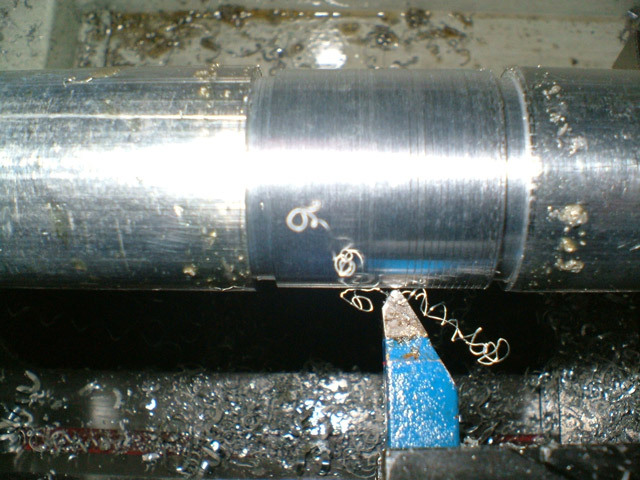 To cut a thread you must make a number of shallow cuts along the job. For each cut to line up with the previous cut, you have to start the cut in exactly the same place each time. This is what the thread dial indicator is for. On the left we see the dial in position 12. 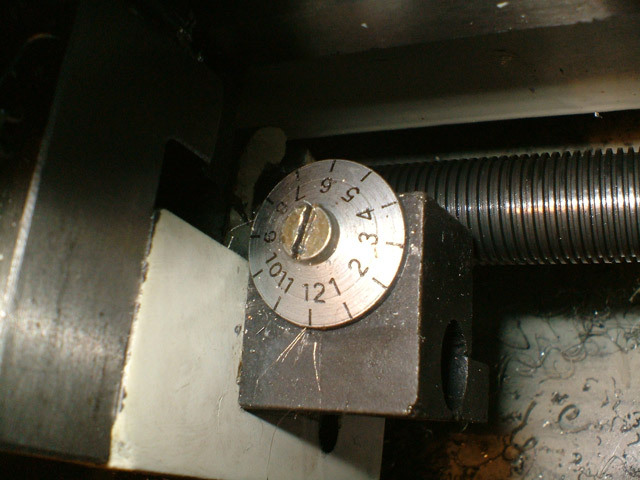 To make my first cut I have to run the lathe slowly until the dial reaches position 12, and then firmly lock down the half nut lever. The carriage, and therefore tool, will start to advance along the job! The first cut is very very shallow, just scratching the surface. This allows us to make sure everything is OK. On this first cut we can run the lathe very slowly with little or no risk of a stall. You should use more cutting fluid than seen in these pictures. Cutting fluid omiited for clarity!